willing to listen to my formal exposition on hand tools. 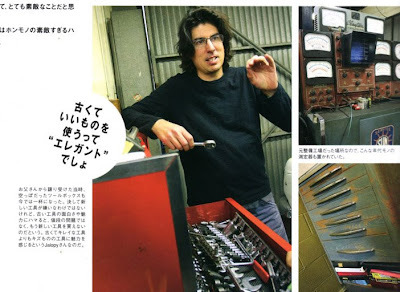 The only thing I love more than Japanese magazines obsessively devoted to an extremely narrow field of exalted objects is BEING in an obsessive Japanese magazine. In this case, Factory Gear Magazine, which is billed as "The Latest Entertainment Magazine of Tools." For 6 hours, the editors photographed and drooled over hand tools that I forgot I even had. By the end of it, even I was damned impressed with my collection of tools.